St George in Southwark Festival has announced the return of its celebrated Dragon Quest on Monday 17th, Friday 21st and Saturday 22nd April - meet and sign in 11.15am. We depart promptly at 11.30am. 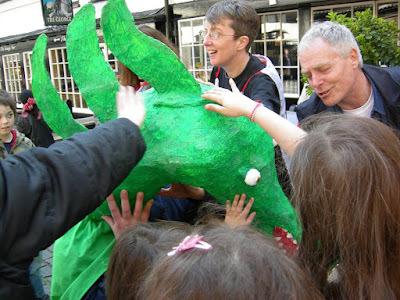 You are invited to join Southwark Mysteries and sally forth in search of fire-breathing scary monsters AND those magical creatures who bring health and healing. Hear their stories and help solve the clues to find signs of St George and The Dragon hidden in nooks and crannies in and around The Borough. The Dragon Quest is devised and led by Southwark writer-performer John Constable with Katy Nicholls, based on an original idea by Sarah Wheeler. Tickets are £3 for adults and free for children. All children must be accompanied by a adult who will responsible for their safety at all times during the quest. Maximum two children per adult. For each of the three Dragon Quests, meet in Tabard Street Piazza SE1 1JA - between the Church of St George the Martyr and St George's Garden (near Borough tube). The Quest begins and ends here. Please arrive in good time. Meet and sign in 11.15am to depart promptly at 11.30am.